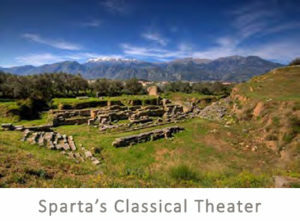 Visitors can travel to Sparta by car or bus. There is no airport in Sparta. 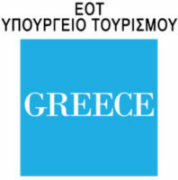 The nearest airports are located in Kalamata and Athens. Sparta is located 225 km south west of Athens, on the south eastern side of Peloponnese. To drive there, you follow the National Highway from Athens to Tripoli, and then you take the rural road from Tripoli to Sparta. The road trip from Athens to Sparta ia approximatelty 2 and a half hours. There are daily buses that connect Athens to Sparta. The buses to Sparta depart from Kifissos Bus Station in Athens. The bus trip is approximately 3 hours. 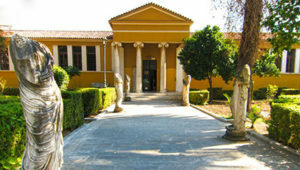 Visit the Archaeological Museum: its exhibits cover a tremendously long period (Neolithic to late Roman age). 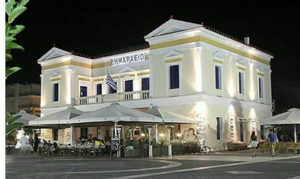 “Koumantários” Art Gallery: admire oil paintings of prominent European artists of the 16th to the 20th century. Visit the Museum of the Olive and Greek Olive oil: get to know the culture and technology of a natural product that is inextricably connected with the Greek and Mediterranean identity. Take a trip to the perched on the sides of mount Taýgetos villages of Ksirokámpi, Koumoustá and Anavrytí with the traditional stone houses and the old stone fountains. In Ksirokámpi, visit the church of Áyios Níkonas with the frescoes of the 14th century. (a) the Temple of Athena Chalkioikos, and (b) the ancient theater of Sparta. The Sanctuary of Artemis Orthia. It was one of the most significant sanctuaries of the Spartan cult and was associated with the education of young Spartans. Menelaion. 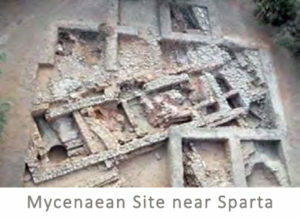 Opposite the Evrotas River, we encounter one of the most significant sanctuaries of Sparta dedicated to Menelaos and Helen. Here, the legendary royals were worshipped as gods. Pellana. Atop the Acropolis of Pellana on ‘Palaiokastro’ hill, recent excavations have unearthed remnants dating back to the Early Helladic period (approx. 2500 BC); this was perhaps a palatial building. 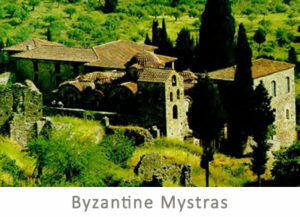 Mystras. The hilltop castle nestled on Mt. 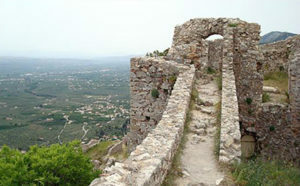 Taygetos was the seat of the Despot of Morea. In 1448, the last emperor of Byzantium, Constantine XI Palaeologos, was crowned here.